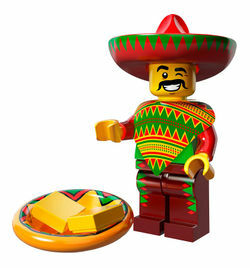 Taco Tuesday Man is one of the characters in the 2014 film, The LEGO Movie. He is similar to the Maraca Man, but he has different printings and colours. He is the only minifigure other than the Maraca Man to use poncho and sombrero pieces. Facts about "Taco Tuesday Man"
This page was last edited on 9 January 2016, at 21:05.